Those of us who have been familiar with the writer from the beginning are aware that, at the start, he confined himself mainly to the fundamentals, trying to scrub away the centuries old crusts which had dimmed the true Islamic concepts and to remove the misunderstandings that had spread gradually regarding the basic principles and purpose of Islam. 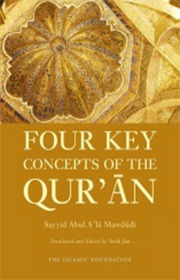 His book, Four Basic Precepts of the Quran, which originally appeared in his monthly Urdu magazine, was one such effort, the intention being to remove the misunderstandings which had come to prevail widely concerning four basic Qur’anic terms, Ilah, Rabb, Deen and ‘Ibadah, and to bring out their true connotations by reference direct to the Qur’an itself. This book will help all those who wish to acquaint themselves with Qur’anic teachings as to the sense in which Muslims should regard Allah Almighty as the Ilah and the Rabb, His Deen as the way of life meant by Him for man, and ‘Ibadah as the primary purpose of His creation of man.